Prespatou Mennonite Church began services and formally organized in 1974, the year it became affiliated with the Chortitzer Mennonite Conference. The first building was occupied in 1974, with a subsequent building program in 1996. The congregation originated through an outreach ministry to Old Colony Mennonites by Dan Wiebe and John Harder, who had both moved to Prespatou from Burns Lake. Cornie and Mary Martens eventually arrived to provide leadership. John Harder was elected minister of the congregation in 1974 and ordained in 1975. He served until his death in 1983. The language of worship is English and German; the transition from German occurred in 1976. The Chronicle (November 1995): 2-3; (July/August 1996): 8. Mennonite Reporter (4 April 1977): 17. Reimer, Margaret Loewen. One Quilt, Many Pieces. Waterloo: Mennonite Publishing Service, 1986: 35. Address: Box 299, Prespatou, BC V0C 2S0; located on Road 101 North of Fort St. John. Steiner, Sam and Richard D. Thiessen. "Prespatou Mennonite Church (Prespatou, British Columbia, Canada)." Global Anabaptist Mennonite Encyclopedia Online. September 2009. Web. 26 Apr 2019. http://gameo.org/index.php?title=Prespatou_Mennonite_Church_(Prespatou,_British_Columbia,_Canada)&oldid=142315. Steiner, Sam and Richard D. Thiessen. (September 2009). Prespatou Mennonite Church (Prespatou, British Columbia, Canada). Global Anabaptist Mennonite Encyclopedia Online. 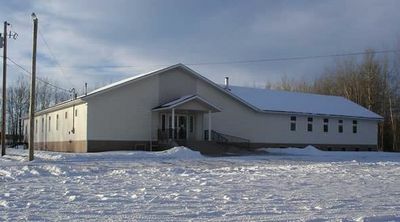 Retrieved 26 April 2019, from http://gameo.org/index.php?title=Prespatou_Mennonite_Church_(Prespatou,_British_Columbia,_Canada)&oldid=142315. This page was last modified on 1 January 2017, at 22:06.